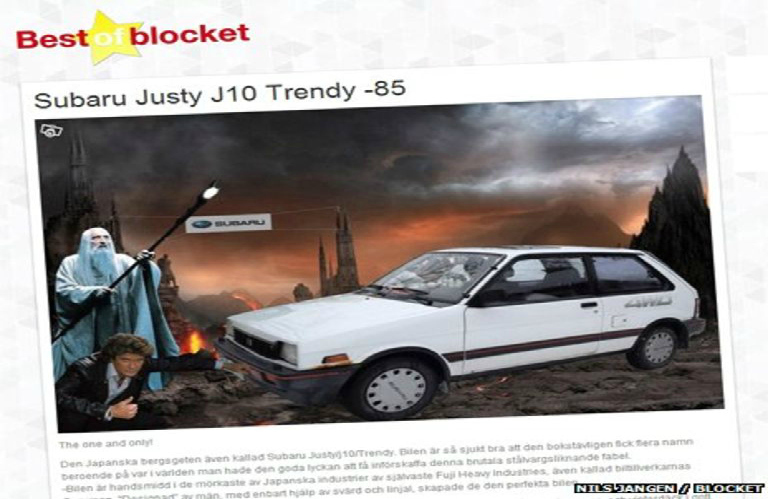 Nils Jangen, 28, was forced to sell his 1985 Subaru online – but he advertised it with such creativity that a high-profile motoring magazine offered him a job, according to The Local news website. Jangen was struggling to find work after moving to a new town to live with his girlfriend, despite sending out around 200 CVs to prospective employers, “I was getting pretty desperate,” he told the site. With his savings running dry and no job in sight, he had no choice but to sell his old car. The unusual advert featured Lord of the Rings wizard Saruman and actor David Hasselhoff. It described the car as being “hand-forged in the darkest of Japanese industries” by “the Saruman of carmakers”. The ad appeared on Blocket – a Swedish classified ads website. The asking price was 10,000 kronor (around £950), but Jangen also said he was willing to trade the car for a job – as his prospects were jokingly “on a par with those of North Korea”. Just one day after posting the advert he was inundated with job offers, and he eventually chose to work at Auto, Motor & Sport magazine. “I’ve always dreamed of being an automotive journalist. I’ve probably watched too much Top Gear in my time, so I said yes right away,” Jangen told The Local.